In the Outlook Folders Tab, the destination folders where ACT-To-Outlook Professional deposits the data are defined. With ACT-To-Outlook Professional you can select which Outlook folder you want to deposit or update the data from the ACT! 2000 database. By clicking on the Pick Folder button, the form pops up which then allows you to enter the destination folder(s) for your conversion. Make sure that the folder selected matches the type that has been requested i.e. Contact Folder should be of type Contact Folder; Appointments folder should be the same as a Calendar folder, etc.. These folders do not have to reside on your local machine. If your current version of Outlook can find the folders, ACT-To-Outlook Pro can find them as well. If a folder is left empty, ACT-To-Outlook will deposit the information in the default folder for that type of information i.e. all Appointments will be created using the default Calendar folder. View. When pressed, the View button will display all the contacts in the database. From this viewer, you can consequently select which contacts you want to convert and then press the convert button. When you receive the select contacts screen, you can select single contacts or multiple contacts to convert. Use the mouse with either the control key down (for individual selections) or with the shift key (for a range of contacts) and select the contacts you want to select. · All. Open Filter, you get to see all the contacts. · A2O Group. Here, the filter used is the group selection active in the Group and Lookup tab. · A2O Lookup. The filter applied here is the filter setup in the Group and Lookup tab. A2O Group. This button converts only the contacts selected in Group filter from the Group and Lookup tab. A2O Lookup. This button converts only the contacts selected in the Lookup Filter from the Group and Lookup Tab. Active Contact. The contact being viewed by the open ACT! is converted. Calendar Only. This option will convert all the contacts that have a calendar items related to the record that is logged in. All. 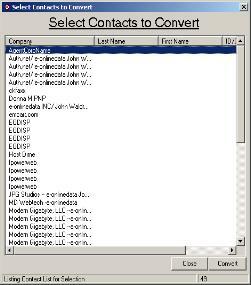 All the contacts in the database are converted. The Active Lookup, Active Contact and All buttons are also available from the ACT! toolbar by default. To add any of the other buttons to the ACT! toolbar, simply click on Tools->Add Icon to ACT! Toolbar and the choices are then added to ACT!. Outlook folders has a size limitation of 16K Items for Outlook 2000 and 2002. Outlook 2003 does not have such a limitation. Enabling size limitation, ACT-To-Outlook Professional allows only 12000 items to be created in a folder and no more. Once 12001 items are created, a new folder is created and all subsequent items are created in the overflow folder. Overflow folders are the same name as the initial folder but followed by a number; for example, Journal is the original folder, all overflow folders are called Journal1, Journal2, etc.. If you disable folder limitation for Outlook 2000 and 2002 and the max number of items are stored in the Outlook folder, Outlook will behave erratically and hang and possibly crash.